Put the sweet potato, onion, carrot, and garlic on a tray and spray with olive oil and season well. Place into a 180C oven for 25 minutes or until vegetables are tender. Remove and cool. Place the vegetables in a blender and puree. Set aside. Boil the potatoes for 30 minutes. Drain and push them through a potato ricer. Place mash into a bowl and add the flour and eggs. Combine to make a dough. Roll the dough into long snakes and chop into pieces to make the gnocchi. Add the remaining oil to a frying pan and toss the gnocchi and sage through. 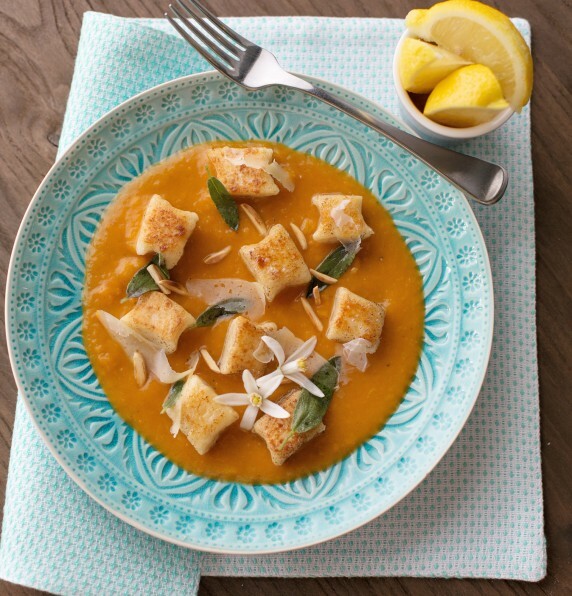 Pour the puree onto a plate, top with the gnocchi and fried sage. Serve immediately.